A hallmark of the evening was the radiant joy and calm confidence of the dancers as progressed the range of styles featured in the varied program. While these qualities were clearly evident in all seven items, the extended final presentation A Time to Dance was a particularly well-selected work to celebrate the burgeoning maturity and youthful vibrancy of the dancers. Stanton Welch’s 1990 work blends classical and character choreography, making it a perfect fit for the evening given the way these styles were threaded through the program. Set to festive Slavonic Dances of Dvořák, A Time to Dance has a summery, outdoor feel. The dancers wore costumes in lemon and orange sherbet tones, and were seated in pairs in a semicircle as various soloists and duos performed centre stage. Two soloists stood out in this sequence. Yichuan Wang and Yuumi Yamada both performed extended solos in which the high quality of their dancing was complemented by their delightful expression. Wang and Yamada both also excelled as Principal Boy and Girl in the opening item, Raymonda Grand Pas. Lisa Pavane, director of The Australian Ballet School, restaged this lovely classical piece, which was performed in The Australian Ballet’s pale yellow and cream costumes. Pavane spoke briefly on stage, paying tribute to the hardworking accompanists of The Australian Ballet School while introducing three items that were to be performed in the Showcase with live accompaniment on stage. Christine Howard, character teacher at The Australian Ballet School for over 30 years, choreographed a charming Défilé that involved a huge number of students across Levels 1-7. Shades of pale blue and purple gave a visual guide to the dancers in each of the Levels. With Youri Mougerman on Balalaika and Izabella Mouguerman on grand piano, the students processed through a series of crisp, lively steps, building in number of dancers to the climax. The school’s Spanish program was represented by the sultry rhythms of Seguirilla, choreographed by Areti Boyaci. Flamenco guitarist Werner Neumann provided live accompaniment as the dozen black-clad dancers performed with focus and flair. After the first interval, the school performed the Australian premiere of Almost by acclaimed choreographer Graeme Murphy. John Tallis’ Fantasy for Violin and Piano was played on stage by Monica Curro and Stefan Cassamenos. The brisk 10 minute piece is an abstract reflection on the longing of youth. Murphy worked with three boys and three girls of the graduating class, making them look even more mature by dressing them in smart daywear. Girls in filmy floral frocks and boys in shirts and trousers moved briskly between various combinations of trios and triangles. Journey is a work for 15 dancers by Margaret Wilson, the School’s Contemporary teacher and choreographer. Creating variations on the theme of travel, Wilson has worked with the dancers to create vivid images including undulating waves, an airport arrivals gate and a bird in flight. The second premiere of the evening was A Singular Sequence by Stephen Baynes, a resident choreographer at the Australian Ballet. To selections of music by Stravinsky, Baynes has choreographed a dozen senior students in an energetic yet elegant work. The piece begins with the sense of a narrative as four boys enter to watch and conspire as four girls dance. From here, the piece becomes more abstract and free flowing Dark purple and black costumes, designed by Peggy Jackson, create an androgynous feel. This aspect is particularly noticeable in the central section, in which a group of four male and two female dancers work as one. The dancers earned rousing cheers acclaim from the appreciative audience as the generously proportioned evening drew to a close. 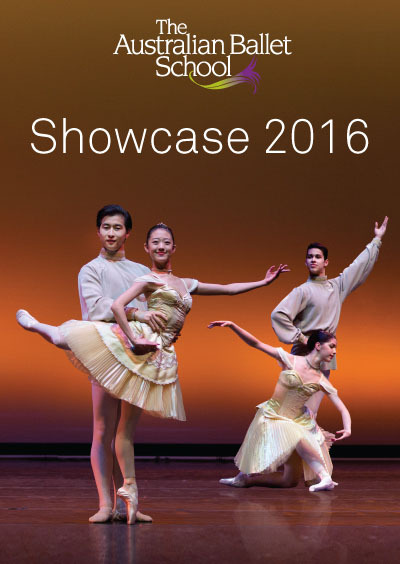 The Australian Ballet School’s Showcase 2016 was performed on Thursday 15 September 2016 at State Theatre, Arts Centre Melbourne. Check back later for images.